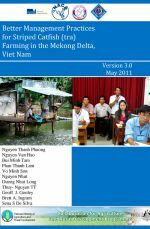 This document is Version 3.0 of “Better Management Practices for Catfish Aquaculture in the Mekong Delta, Vietnam”. It incorporates revisions of previous versions and experiences from demonstration farms, as well as feedback from a National CatFish BMP Workshop, held 23-24 November 2010 in Long Xuyen City, An Giang Province, involving all stakeholders of the tra/striped catfish (Pangasianodon hypophthalmus) farming sector of the Lower Mekong Delta. A Vietnamese translation is available. 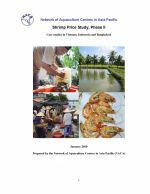 This report is the outcome of a study conducted by NACA to assess the shrimp price trends in Vietnam, Indonesia and Bangladesh from January 2008 to June 2009, updating the previous study Evaluation of the impact of the Indian Ocean Tsunami and US Anti-Dumping Duties on the Shrimp Farming Sector of South and South-East Asia, 2006. The previous study highlighted the need for continuous collection of price data at all levels in the supply chain. 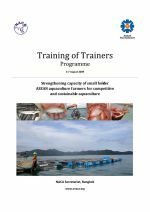 This is the manual for the "train the trainers" course aiming to increase the capacity of small-scale farmers in ASEAN countries. 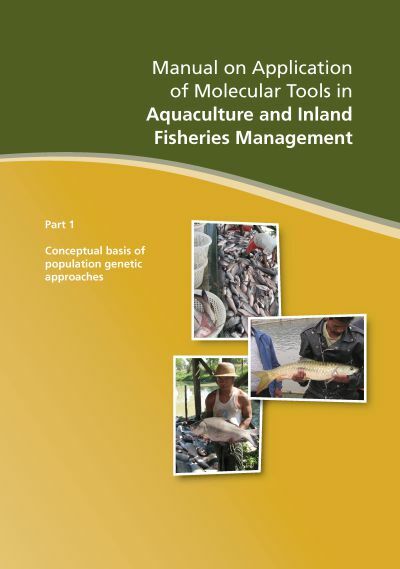 The manual focusses on five countries and commodities: Snakehead (Cambodia), Tilapia (Thailand), seaweed (Philippines), marine fish (Indonesia) and shrimp (Vietnam). In this volume, lectures presented by experts are included. The training program included technical aspects related to the culture of commodities, marketing, access to information, organization of farmer groups, gender and good culture practices. An overview of the current scientific knowledge available on climate change implications for fisheries and aquaculture is provided through three technical papers that were presented and discussed during the Expert Workshop on Climate Change Implications for Fisheries and Aquaculture (Rome, 7-9 April 2008). 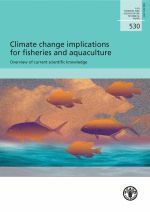 A summary of the workshop outcomes as well as key messages on impacts of climate change on aquatic ecosystems and on fisheries- and aquaculture-based livelihoods are provided in the introduction of this technical paper. Fish species introduction has been a very important method of increasing fisheries production and economic output in China. A good example is the introduction of the icefish Neosalanx taihuensis into reservoirs and lakes in most areas of China. 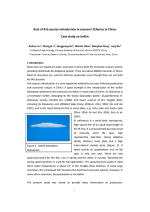 The present study aims to provide basic information on production, management strategies and biological characteristics in target reservoirs and lakes in China and guide introduction and management practices of the fish. The vegetation in Mahakam Delta is predominantly mangrove forest that consists of a pedada zone, Rizophora zone, transition zone, Nipa zone and nibung zone. Prior to 1980, mangrove vegetation in Mahakam Delta was pristine. Considerable changes in the extent of mangrove ecosystem occurred between 1990-2002 until 2001 when about 63% mangrove areas was deforested mainly due to conversion for shrimp ponds. Since 2002, partial efforts for restoration had been taken in mangrove replanting at some sites. Reservoir fish fauna, fisheries production and management methods, amongst others factors, differ widely. The differences in fish yield between reservoirs and/or between countries cannot be easily understood and are unlikely to be determined by individual parameters or characteristics. 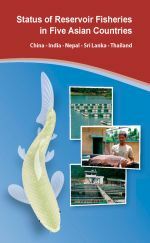 This volume takes stock of the current management practices with a view to utilising this knowledge to develop and or evolve appropriate national and or regional strategies for sustained development of reservoirs fisheries. This report provides an appraisal of the status of mangrove ecosystems and linkages with associated communities and their livelihoods. 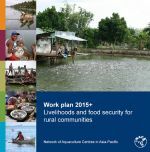 The report addresses ecosystem health and function, the livelihoods of poor people, goods and services and gender issues. The major causes of impacts to mangrove forest and related aquatic resources are considered along with community perceptions of trends in natural resource quantity, economy, social relations and conflicts. Relevant policies and laws are briefly reviewed. Chúng tôi xin trân trọng được giới thiệu với bạn đọc cuốn sách Biện pháp phát triển nghề nuôi cá hồ chứa nhỏ ở châu Á. Mục tiêu của cuốn sách không nhằm hướng dẫn thực hành như tài liệu khuyến ngư, mà thực sự là công trình tổng kết kinh nghiệm từ kết quả thực tế của nhiều địa phương, kết quả nghiên cứu khoa học, và những cơ sở lý thuyết liên quan đến lĩnh vực này. Fish and fish products are crucial in the nutrition and livelihoods of the Myanmar people. 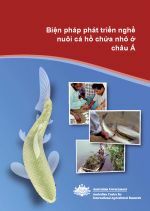 However, little information is available on their patterns of consumption, inter-regional differences, availability and types of fish consumed. This report is the outcome of two concurrent missions, one to coastal areas and one to inland areas. 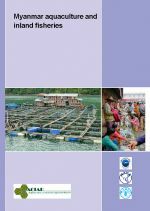 The report includes the findings of the missions as well as conclusions and recommendations in support of the long-term sustainability of fishery resources in Myanmar.